Dont Cry Over Spilled Milk ! Mom and Dad told me they were going on this really awesome fun-filled vacation. I said, Cool! when do we leave? Then they explained that Rosy and I couldn't come. Hello? What's with that? So of course I was bummed. But then I found out who was going to stay with us. Brian! one of my best human friends. I always have the greatest time when I'm with him. So I decided to make the most of my time and take a vacation from blogging. In fact, I am not even going to open my iPaw. See ya in a few weeks! 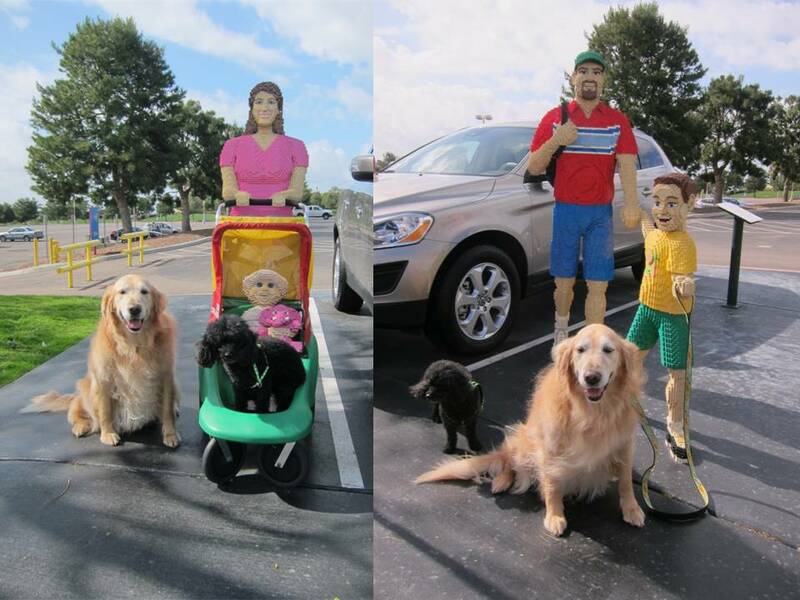 The other day, Mom and Dad went out and left Rosy and I alone. Rosy went upstairs to take a nap. That left me bored and a bit hungry. So I walked into the kitchen and eyed the treat basket on the counter. Even though it was beyond my usual reach, I took the challenge. I was able to reach one bag which knocked down some others. SCORE! Then I carried each bag over to my bed to admire my potential feast. But then I started feeling really guilty. I dont like to get in trouble. So I decided not to eat anything, and just drool on the bags instead. When Mom and Dad came home, Mom was proud that I didnt eat the treats, so she gave some to me legally. I feel so much better being a good boy. The other day Mom and Dad took me into this place called New Balance. It was full of sneakers. Weird! I was a bit freaked at first but Rosy explained we were shoe shopping . (she has done this many times.) So she sat comfortably up on a seat and watched as Mom and Dad tried on sneakers. So I figured, while I was there, maybe I could do some shopping too. None of the sneakers fit me. So many problems being a dog. 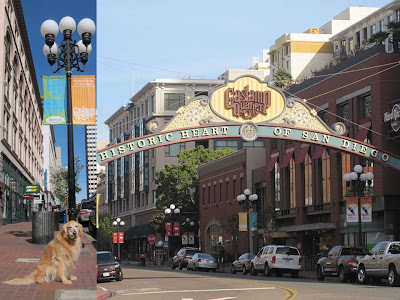 Another cool place in San Diego is Old Town. It's considered the birthplace of California cause in 1769, Father Junipero Serra came to establish the very first mission of 21 missions that were to be the cornerstone of California’s colonization. In the 1820's, a small Mexican community of adobe buildings was formed and by 1835 became El Pueblo de San Diego. Then in 1846, the American flag was raised in the Old Town San Diego Plaza. 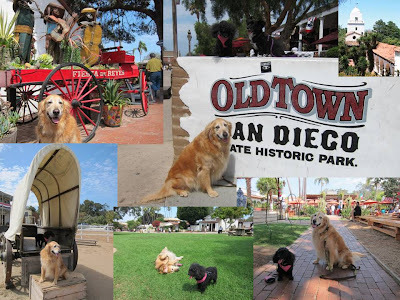 Now you can go to to Old Town and see what San Diego was like during the 1800's through exhibits, museums and living history demonstrations. But most importantly to me, Old Town is SO dog friendly. We can walk around pretty much everywhere outside. We can roll in the grass in the park. Sniff outside all the historic buildings and interesting stores and carts. And Old Town smells so yum from all the delicious cooking going on that it puts makes me so hungry. But that's OK, cause there are all sorts of cafes which welcome dogs. I cant wait to go back. Today is Fat Tuesday! So Rosy and I thought we would put on our Mardi Gras hat and tiara (respectively). Then Mom decided to act like a person on a parade float and every time Rosy barked, she would throw beads at us (and adorn us with them). 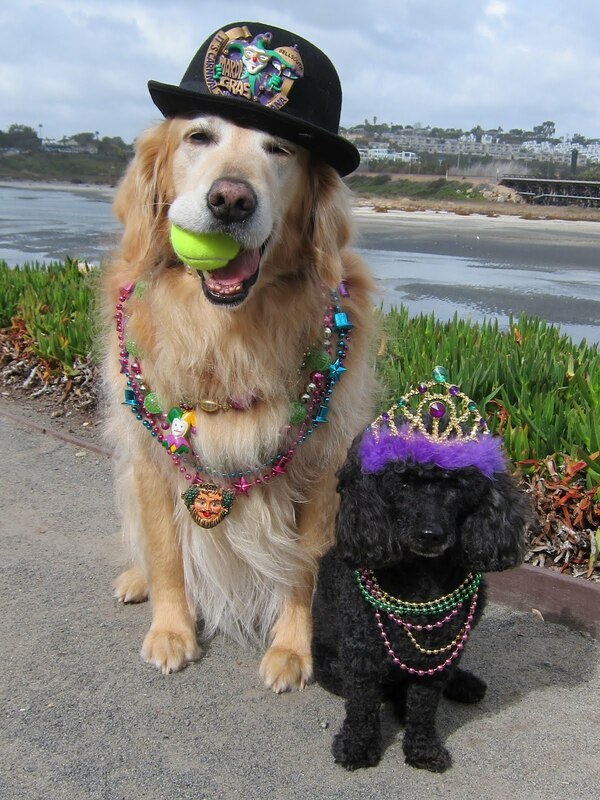 We are hoping that Mom will give us a traditional Mardi Gras King Cake. Rosy wants to find the piece with the small baby toy inside so she can be declared Queen. I said I thought she always declared herself queen. She corrected me and said that she is a Princess and would like to be promoted. George Washington’s actual birthday is Feb 22, 1732, but we start partying early as today is Presidents Day. Washington was a big time guy here in the late 1700's. He was Commander in Chief of the Continental Army and led us to victory over the British in the American Revolutionary War. He’s best known for being first Prez of the United States and was elected unanimously - none of this silly campaign stuff. 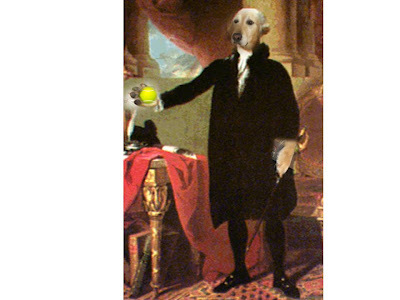 But not only was he one of the best presidents and military leaders ever, did you know he loved dogs? One of his fave dogs was named SweetLips! He even called a cease fire to return a lost dog to his enemy! Now that is a great man! If I were Prez Bear, I would want to be just like George Washington! Happy Birthday to the "Father of our country". The other day we went to LEGOLAND. Did you know that LEGO® were wooden toys made by Ole Kirk Christiansen in his small workshop in Billund, Denmark in 1932? He named the toys LEGO®, a contraction of the Danish words 'leg godt,' meaning 'play well.' . Interesting! Anyway, LEGOLAND California is a 128-acre park with over 50 family rides, "hands-on" attractions and shows, Of course I didn't get to go in because of the usual canine discrimination, but we did get to meet a LEGO family. Rosy got to go in the LEGO stroller and the boy wanted to walk me. I thought the LEGO family would be really friendly, but actually they were quite stiff. When we come back from the beach, Rosy goes inside with Mom to get a sink spa treatment. First Mom wraps her up in a towel so she wont get cold while waiting for the water temp to be perfect. Then she gets a warm Vichy massage with bergamot conditioning shampoo. After the spa treatment Rosy goes to the bathroom salon to get her fur blow-dried and brushed. And while all this is happening, I am outside with Dad getting a bath with a cold hose. How should I feel about this? FINALLY! I got to play with a guy dog at the beach ! 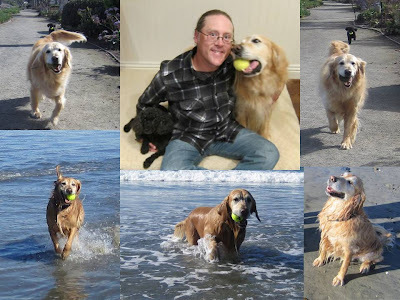 And believe it or not, he was a Golden Retriever named Bear! And amazingly, his Mom called him BearBear ! He loves the beach , loves tennis balls and loves swimming and retrieving tennis balls in the ocean ! If he wasn't taller and redder than me, I would think he is my clone! I didn't ask, but I assume he also loves pizza. Today is Valentine's Day. I want Mom as a Valentine and Rosy wants Dad. So we thought of a brilliant idea. Instead of getting Mom and Dad Valentine's cards, we thought we would just give them the shirts off our backs! Rosy thought it would be nice to dress up for Valentines Day. So she rummaged through her things and thought she found the perfect outfit. She could be a Love Bug Princess. She came over to ask me what I thought. I didn't know what to say. So as not to hurt her feelings, I waited till she turned away to let out a silent chuckle. Really Rosy? It's Don't Cry Over Spilled Milk Day. It is a day to be optimistic, think positive, look on the bright side, and to find something good in everything that happens. We all know that poop happens. But when it does, don't worry, or cry over it. Rather, fix it, or get over it. 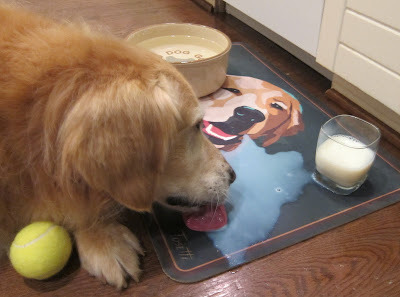 Take my example, if I spill milk, I don't cry, I just lick it up! YUM! The other day Mom said she wanted to get strawberries. So we all piled into the car and I figured we would head to the grocery store. But we drove in a different direction and there I saw a big STRAWBERRIES sign. Behind it were these fields of strawberry plants. I got excited cause I thought we could all go out and pick our own. But since I wasn't allowed, Mom said we would buy them from the little stand. I am not usually attracted to berries, but these looked SO good. So when we got home, Mom let me try a strawberry. YUM! So now I have asked Mom to put some cut up Strawberries on my breakfast kibble. My sightseeing activities continue. This time we ended up in A Park at the Park. Its called that because it is a park in Petco Park, home of the San Diego Padres baseball team (hence, the ballcap.) The park is a grassy berm sloping above the outfield fence. Its open during game time, allowing fans to sit and watch games for only $5. When no games are being played, it serves as a free local park for area residents. I cant wait to come back here in August for Dog Days of Summer. That's when us canines can come and watch the Padres play! Today is the birthday of Scouting in America. On February 8, 1910, Chicago publisher William Dickson Boyce filed incorporation papers in the District of Columbia to create the Boy Scouts of America. 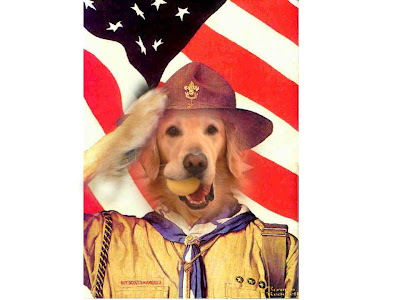 I read that Scout law says a Scout is trustworthy, loyal, helpful, friendly, courteous, kind, obedient, cheerful, thrifty, brave, clean, and reverent. Well, I think I have those qualities. I wonder if they would let me, a canine, be a boy scout. I would start as a (Bear) Cub Scout of course. Since Mom is not supposed to walk much now, she has decided that we all need to drive around and see the sights of San Diego (other than the beach.). So the other day we ended up in the Gaslamp Quarter, the historic heart of the city. In the 1860s, it was known as New Town, in contrast to Old Town, which was the original Spanish colonial settlement of San Diego. And yah, gas lamps do line the streets and there's lots of restaurants and shops. All the Victorian architecture is real cool. I wonder where my sightseeing will bring me next? Today is Superbowl Sunday. Its the New York Giants vs the New England Patriots. I am not partial to either team which got me to thinking. Maybe that qualifies me to be a guest commentator. 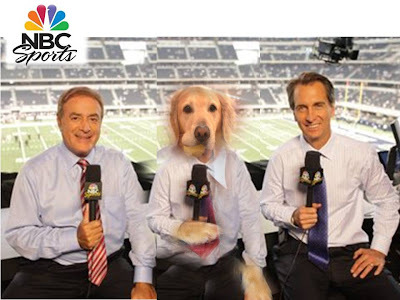 Al Michaels and Cris Collinsworth are great announcers, but I bet I could bring in a whole new audience that may otherwise only watch the PuppyBowl on SuperSunday. Would you watch me? The other day I got to go to the bowling alley. First, I freaked at all the crashing sounds. But then when I took my paws off my eyes, I saw balls rolling down lanes and hitting big bowling pins. Cool! It got me to thinking, how could I bowl? Well, my paw fingers could not fit into bowling ball holes. But I could nudge the ball with my nose real hard. I bet I could get lots of strikes. Hmmm. Maybe I could be the King Pin of the bowling alley! P.S. BearHUGs to Mira Mesa Bowling alley for letting me visit. 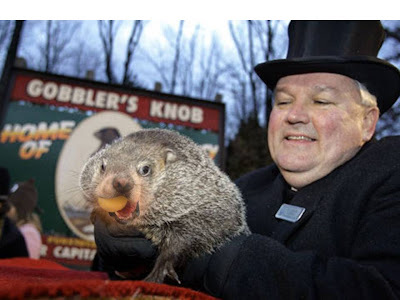 Tomorrow is GroundHog Day. So everyone will be watching to see whether Punxsutawney Phil will see his shadow or not. That got me to thinking. 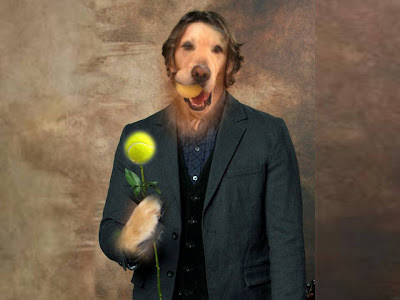 If someone dropped a tennis ball down his hole would he would retrieve it when he came out ?